We are so excited to have Tara, from Suburble, guest posting for us today! Please show Tara some love by visiting her awesome blog and keep in touch with her on Facebook, Twitter and Pinterest. Hi friends! My name is Tara, and I blog at a little place on the internet called Suburble. I love to craft, get my hands dirty, and try new things. Today I’m sharing a project that is simple, quick, and has great impact – wood burned Christmas ornaments! The first step is to drill a hole at the top of each wooden blank, so the Christmas ornaments can be hung with the ribbon. The design possibilities for your ornaments are practically limitless! Whatever shape you can print out on your computer can be transferred. If you are new to wood burning, keep it simple for your first few designs. After you have printed out your shape (I chose a snowflake from the free photo editing software, Picmonkey.com), use a pencil to heavily shade the opposite side of the shape. You are creating faux “carbon paper” this way. Cut out your shape and tape it – right side up – to your Christmas ornaments. Using your pencil, firmly trace over the stencil. Remove the paper, and shazam! Instant – resusable – transfer. You are so clever! If you are going to reuse the stencil, be sure to “reload” the carbon by running a pencil over the back of the paper again. Plug in the wood burning tool and set it on its stand. I opted to work on top of a piece of cardboard, only because I didn’t want to potentially damage my table top. 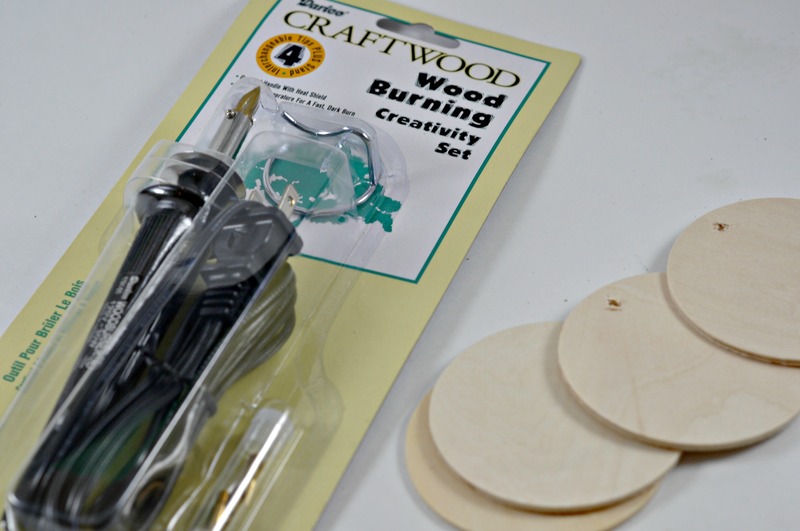 The wood burning tool comes with four tips – calligraphy, all-purpose, fine-tip, and shading. I opted to start with my calligraphy tip for the snowflake. Just a quick, “Been there, have the scar to prove it” tip: It doesn’t take long for the tool to get very hot. Before you dive into wood burning, it’s handy to do a few test runs on an extra wooden shape. Get the feel for the tool and how it burns. Each wood will burn differently, and each tip will produce a different result. Before changing tips, be sure to unplug the tool and let it cool completely. The snowflake was a simple and easy shape to burn. I used straight lines as I traveled over the stencil – I love how it resulted in a ‘rustic’ snowflake. I used the fine tip point on the star ornament. “Noel” was created in Word with the Callie Hand font. I love the simplicity and charm of these Christmas ornaments. They can be left unfinished, or colour can be added through stain or a paint wash. The possibilities of these Christmas ornaments are endless – consider gift tags, stocking labels, or even Baby’s First Christmas. I know that this won’t be the last of my wood burned crafts this Christmas! We would like to thank Tara for this great ornament idea! Don’t forget to check out her blog, Suburble. I love how rustic these turned out! I think this is soldering for craft bloggers. Awesome craft! I love the rustic look of this ornament…and it’s so easy to make! What a great project! These are great! I’ve always wanted to try woodburning…I think you gave me the motivation to start trying! Such a neat idea! I will have to give this a try! Thanks! Those are awesome! What a great idea Tara! They would be very pretty tied to packages, too! I have a wood burner that I barely use! Thanks for making me want to get it out again!! You have one, Melanie? I’m really excited to see what I can do with this thing – my mom mentioned leather. I’m thinking that I have to scout some out! Beautiful! I need to try this! Oh My Gosh. I love love love these. Great Idea!!! Can’t wait to make them. How classy! These really turned out beautiful! JaneEllen – you’ll have to let me know how yours turn out! I’m getting pretty excited to do even more projects with my wood burning tool – my mom remembers tooling leather with hers as a kid!